Welcome to Callaway County EMA Website! The Callaway County/Fulton Office of Emergency Management Web Site is designed to support and inform the citizens of Callaway County with information pertaining to community and individual planning and preparedness. Local Emergency Planning Committee (LEPC) information and updates are also available on this website. Smart911 is a free service available to all citizens and is 100% private and secure. 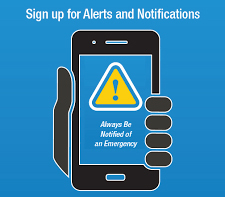 Get alerted about emergencies and other important community news by signing up for our Emergency Alert Program. This system enables us to provide you with critical information quickly in a variety of situations, such as severe weather,unexpected road closures, missing persons and evacuations of buildings or neighborhoods. You will receive time-sensitive messages wherever you specify, such as your home, mobile or business phones, email address, text messages and more. You pick where, you pick how. Click on the logo below to sign up for alerts. See our Training Page for upcoming training events. With summer approaching please review our Summer Safety page. To see weather radar and information, click on the following link: National Weather Service. The Mission of the Callaway County Emergency Management Agency is to protect the lives and property of all Callaway County residents when major disasters threaten public safety in any community. The Callaway County Emergency Management Agency responds to two types of disasters - natural and manmade. Natural disasters are major snow and/or ice storms, floods, tornadoes and/or severe weather, as well as the threat of a serious earthquake along Missouri's New Madrid Fault. Manmade disasters, also known as technological emergencies, may include hazardous material incidents, nuclear power plant accidents and other radiological hazards. The Callaway County Emergency Management Agency is also responsible for developing a County Emergency Operations Plan which coordinates the actions of Missouri State government departments and agencies in the event of any emergency requiring use of State resources and personnel." © 2009 Callaway County Emergency Management Agency.